NASHVILLE— Playing four days in a row is never easy. After willing his team to victories over South Carolina and Florida, it’s understandable that Auburn’s Jared Harper had little left to give in Sunday’s SEC championship. The superstar junior was just 1-of-8 from behind the arc and 1-of-11 overall. He hit the proverbial wall, but that’s okay. Just a week after defeating the Volunteers at home on Senior night, Auburn needed a perfect game to claim the title…. or so they thought. Instead while Harper struggled, others emerged and Auburn rolled to an 84-64 victory in Nashville. Chuma Okeke finished with 18 points and Danjel Purifoy added 10 points off the bench. However, it was senior Bryce Brown who proved to be unstoppable on Sunday. Brown’s 19 points led the way and earned him Most Outstanding Player honors. “We still have a lot more to accomplish and prove as a team,” Brown said. Prior to this season’s tournament, the Auburn upperclassmen never even experienced winning an SEC tournament game. Auburn has now defeated Tennessee in its last three meetings. 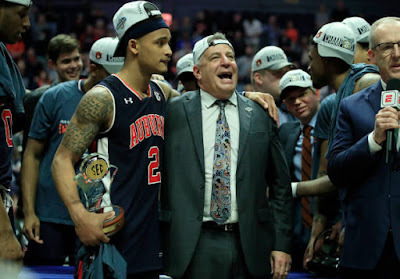 While it’s easy to draw conclusions, coach Bruce Pearl says there’s no extra motivation in beating the Volunteers despite being there from 2005-11 in the same capacity. After Brown and Okeke each buried five three pointers, practically the entire second half was garbage time. “I think we are very strong, especially our bench. Our bench doesn’t drop off. We’re still undersized, but we got a lot of heart,” said Chuma Okeke. Like most things in life, the celebration will be short-lived as Auburn drew the No. 5 seed and plays 12-seeded New Mexico State Thursday in Salt Lake City.